Can you keep a popsicle preserved from the sun's radiant energy? Kids test out a variety of insulators to see what type of material will preserve a popsicle the best, preventing the transformation of solar energy to thermal energy! Kids work in teams using aluminum foil, packing peanuts, bubble wrap, paper towels, newspaper, as well as a variety of other items to construct insulators. Then, they put their protected popsicles out in the sun. 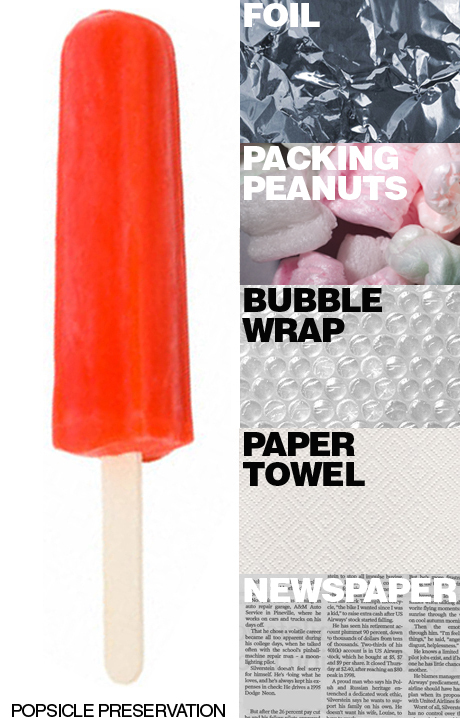 Along with the insulated popsicles, put one uninsulated, unwrapped popsicle outside as well. Who's popsicle can withstand the heat? As soon as the uninsulated popsicle melts, check your protected popsicles. Then, record your findings.